The Gas-Tec 600 cordless, butane gas glue gun has been so popular that we have launched the Gas-Tec 600 KIT. 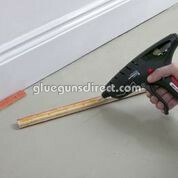 As many now know the GAS-TEC 600 is a robust compact portable cordless glue gun that runs on butane gas. It does not require mains electricity or batteries but operates using easily refillable LEC™ (Liquid Energy Cells) power technology. It can be used for a huge range of applications from shop fitting, exhibition displays, flooring and carpet laying, ceramic tile displays, low voltage wiring, to Paintless Dent Removal (PDR) and is now supplied in a handy carrying case.